That final bell might have meant no more tests and teacher's dirty looks for the kiddos, but for me it was a reminder that I have 2 and a half months of time to fill. Considering girlchild interrupted me no less than 7 times while I tried to write that last sentence (she is under the misguided delusion that all I do everyday is wait on her brother and sister whilst they lounge upon the couch - have to make her see reality at the start of EVERY vacation), I need all the help I can get. 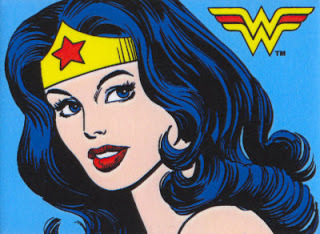 I will be proudly sporting my Wonder Woman cape. 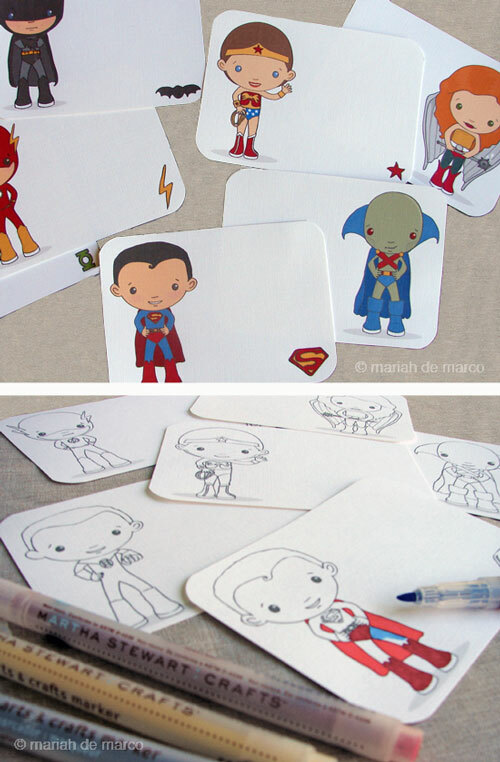 Last month, I wrote about instituting a Make Your Own Comic day for the kiddos. We are doing this, very soon with some of their buddies. My plan right now is to have the kids make their comics, then I'll bind them and a few days later, they will get them back at the Summer Superhero Party. Now, when I put together a party for the kids, I have a few ground rules. 1) It has to be at a park. Having the kids come over for playdays is fine, but when it is a large group of kids, the park is our best bet. I have a smallish house, so having a very large group here is not so easy. That and I don't have to spend days before and after cleaning my house. Bonus, there is playground equipment so the kids can scale the rock wall like Spiderman, zoom down the slide faster than the Flash, and fly higher than Supergirl on the swings. 2) All crafts and recipes must be easy enough for the kids, and more importantly, me, to accomplish. There are all kinds of pretty, pretty things on Pinterest that sure, I could put together by spending hours upon hours crafting or cooking. I would probably get some Ooohs and Ahhhs from my friends, a few "How did you have time to do all that?" (I don't) and if I'm lucky the kids will say "Cool!" before they trash everything to hell and back. The best thing about the kids at this age is, they really just want to go play with their friends. Add in some capes and costumes (that we already have), some fun snacks and some paper or foam crafts and they will say that it was a very thrilling day. Note: the "thrilling" part is very important this year. The kids have watched Judy Moody and the Not Bummer Summer (on Netflix now). In it, Judy and her friends try to accumulate thrill points by doing fun things during the summer. The girlchild already made her poster. 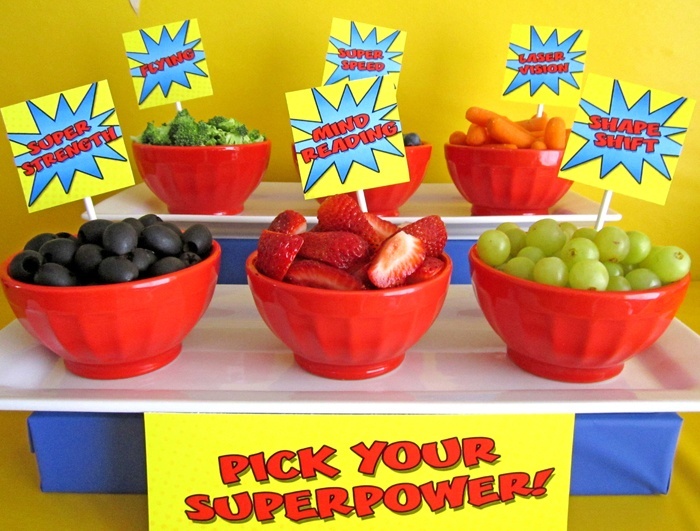 Read on after the break for some easy and inexpensive ideas for your own superhero party. My favorite pins are also all on my Project Summertime board. 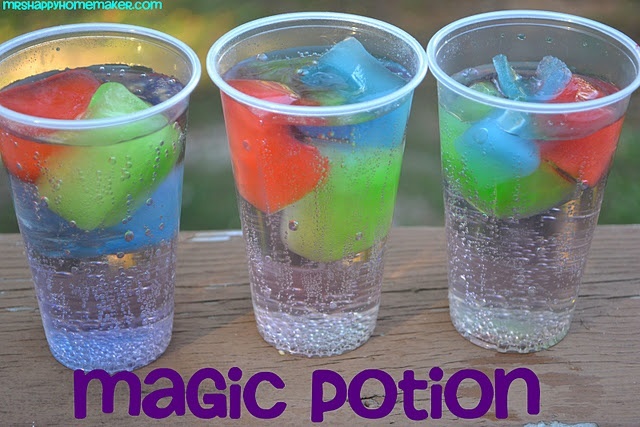 This drink looks fun and easy: make ice cubes from different flavors of Kool Aid. Put in a glass with whatever variety of lemon-lime soda you prefer. At the park I would have to do this early, but it would be a fun way to kick off the party. They will be running like crazy, staying hydrated is important, of course. 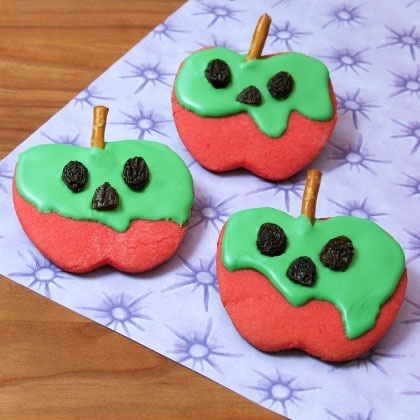 For snacks, I was planning on using a star cookie cutter to cut out watermelon as well as make some star cookies for the kids to decorate. Maybe bust out some Ninja dudes too. The kids always love the Ninjas. Blueberries for invisibility, carrots for X-ray vision, strawberries for super speed, and so on. That's what I'd call "super snacking." I've seen many different kinds of masks on Pinterest. This one looked pretty easy. Just bring some construction paper, craft foam and elastic string and let the kids do the rest. These coloring pages are very cute. 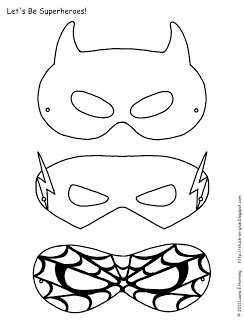 Also, check out free printables from Disney and Marvel and DC comics. For games, changing Hot Potato to Kryptonite Catch would be a fun one, as well as Doc Ock tag (instead of octopus tag), or Mr. Freeze tag. You might want to check out Target and their line of Justice League items (I already got the serving tray): http://www.target.com/c/all-summer-gear-justice-league-brand-shop/-/N-55msv#?lnk=lnav_shop%20by_8 Thanks to Megan for the link! Are you planning to have a gala time? Get some unique party idea from http://birthdayplanet.net/parties/show/81-glam-limo-party, and give it a try.